210Po is an intermediary member of the natural mass number (4n+2) 238U decay series that finishes at a stable 206Pb, according to the sequence: 238U (4.49 Ga, a) ® 234Th(24.1 d, b-) ® 234Pa (1.18 min, b- ) ® 234U (0.248 Ma, a) ® 230Th (75.2 ka, a) ® 226Ra (1622 a, a) ® 222Rn (3.83 d, a) ® 218Po (3.05 min, a) ® 214Pb (26.8 min, b-) ® 214Bi (19.7 min, b-) ® 214Po (0.16 ms, a) ® 210Pb (22.26 a, b-) ® 210Bi (5 d, b-) ® 210Po (138 d, a) ® 206Pb. The 238U descendants are produced continuously in rocks and minerals, since uranium is among the main elements contributing to natural terrestrial radioactivity. It is a lithophile element that is concentrated preferentially in acidic igneous rocks compared with intermediate, basic, and ultrabasic varieties. Some 210Po atoms escape the rocks and soils to the surrounding fluid, such as groundwater during interactions between the liquid and solid phases. Both 210Pb and 210Po in water are well-documented radionuclides for health risks, as WHO has proposed a guidance level of 0.1 Bq/L for the activity concentration in drinking water in order to not exceed the reference dose level of the committed effective dose equal to 0.1 mSv from one year of consumption. Analyses of most natural waters have shown that 210Po is present at very low activities, usually even lower than its insoluble precursor, 210Pb. 210Pb is a particle-reactive radionuclide readily removed from the water column through adsorption onto particulate forms of matter and their coatings (organic or Fe-Mn oxides). Numerous studies have utilized 210Pb derived from 210Po-data as a chronometer for sediment accumulation and mixing in lakes, estuaries, marshes, and coastal areas, since they have provided a reliable dating method over the last 100-150 years. The importance of the Amazon area to sustain the global equilibrium in the environment has been recognized worldwide. This has been much more accentuated presently due to the intense debate related to global warming. Consequently, all initiatives/studies directed to a better knowledge/management of that huge environment are welcome and needed. 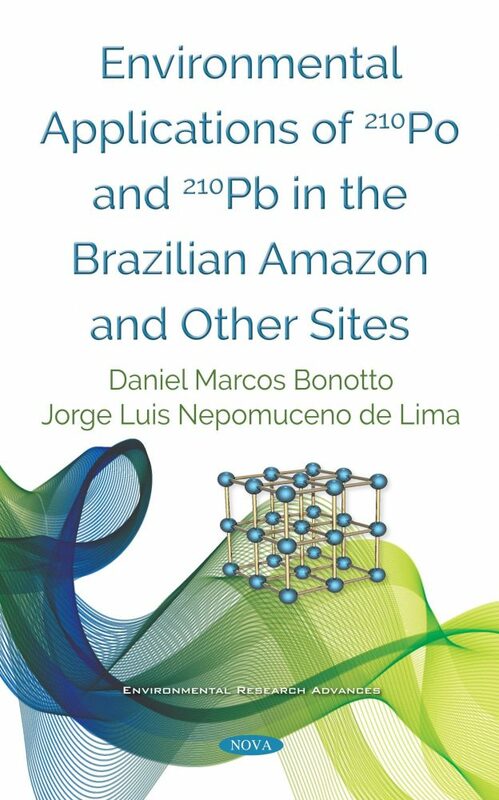 This book is a contribution to this task, which presents a revision of a 210Pb and 210Po database in the Brazilian Amazon area and in sediments providing from different hydrographic basins in São Paulo, Brazil. The book is mainly directed to university students (undergraduate, graduate and postgraduate), researchers, decision makers, politicians, environmentalists, and interested public in general. The text may be used for teaching, research and professional reference. The principal audiences for the book are related to the following subject areas: Geosciences, Ecology, Environmental Engineering, Chemistry, Biosciences, Hydrology, and Toxicology.